The Global Volcanism Program has no activity reports for Tajumulco. The Global Volcanism Program has no Weekly Reports available for Tajumulco. The Global Volcanism Program has no Bulletin Reports available for Tajumulco. The Global Volcanism Program has no synonyms or subfeatures listed for Tajumulco. Tajumulco is Guatemala's highest peak and the highest volcano in Central America. Two summits, one with a 50-70 m wide crater, lie along a NW-SE line. A lava flow from the ~4200-m-high NW summit traveled down a deep valley on the NW flank. The andesitic-dacitic volcano was constructed over the NW end of a large arcuate SW-facing escarpment of uncertain origin. Tajumulco has had several unconfirmed reports of historical eruptions. Sapper (1917) considered it to have erupted during historical time, but without accurate dates. The volcano was reported to eject many rocks, destroying houses on 24 October 1765, but this may have been a rock avalanche. Juarros reported some eruptions before 1808, and there are unlikely reports of eruptions in 1821 (or 1822), 1863, and 1893 (Incer 1988, unpublished manuscript). There is no Deformation History data available for Tajumulco. There is no Emissions History data available for Tajumulco. Tajumulco, the highest volcano in Central America, is seen here from the NW from the slopes of Tacaná volcano, which lies along the México/Guatemala border. Conical Tajumulco volcano has twin summits, which are not distinguishable in this view. A lava flow from Tajumulco's NW summit traveled NW down a deep valley on the flank. Tajumulco has had several unconfirmed reports of historical eruptions. 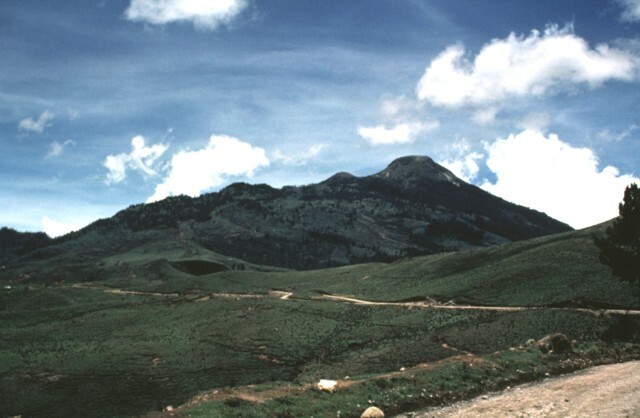 A road in the relatively sparsely populated far western part of Guatemala approaches the NE side of the summit massif of Tajumulco volcano; this side has gentler slopes and higher agricultural use than the NW side. Tajumulco lies NW of the main tourist areas in the Central Highlands and is infrequently visited. 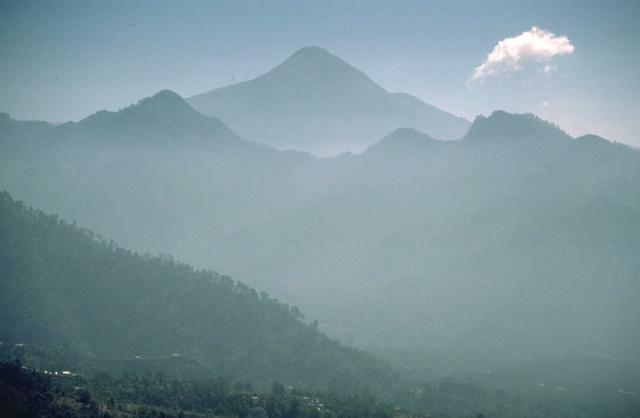 The volcano is located closer to Tacaná volcano on the México/Guatemala border than it is to other Guatemalan volcanoes. Tajumulco, the highest volcano in Central America, is seen here from the NNW. The volcano rises steeply above deeply dissected valleys cut in plutonic and Tertiary volcanic rocks. 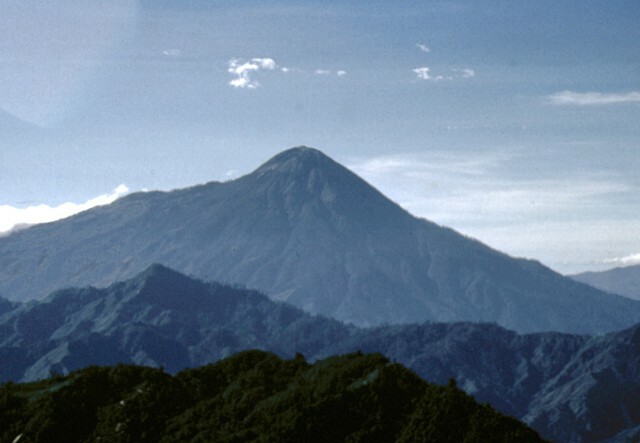 Despite its prominence, the 4220-m-high volcano is located in a relatively infrequently visited part of western Guatemala and is much less known than many other Guatemalan volcanoes. Tajumulco has had several unconfirmed reports of historical eruptions. 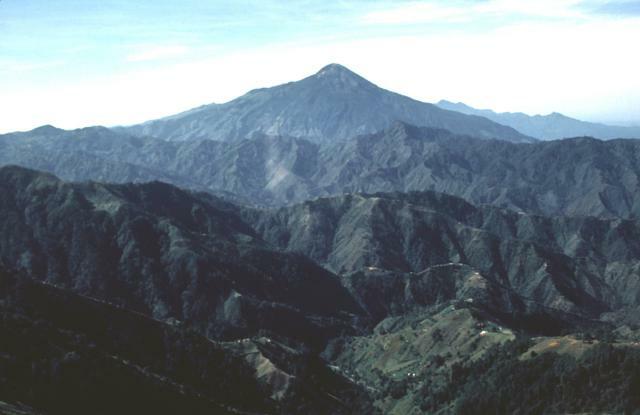 Tajumulco's southern flanks (left), which descend toward the Pacific coastal plain, are steeper than its northern flanks. Dioritic plutonic rocks are exposed at the base of the volcano. Tajumulco is Guatemala's (and Central America's) highest volcano, but is one of the least known of the country's major volcanoes. There are no samples for Tajumulco in the Smithsonian's NMNH Department of Mineral Sciences Rock and Ore collection. IRIS seismic stations/networks Incorporated Research Institutions for Seismology (IRIS) Data Services map showing the location of seismic stations from all available networks (permanent or temporary) within a radius of 0.18° (about 20 km at mid-latitudes) from the given location of Tajumulco. Users can customize a variety of filters and options in the left panel. Note that if there are no stations are known the map will default to show the entire world with a "No data matched request" error notice. Large Eruptions of Tajumulco Information about large Quaternary eruptions (VEI >= 4) is cataloged in the Large Magnitude Explosive Volcanic Eruptions (LaMEVE) database of the Volcano Global Risk Identification and Analysis Project (VOGRIPA).